October 13, 1926: “The Gumm Family” performed at the Costume Bridge Party held for the Gumm family, at the home of Mr. and Mrs. R.D. Brugess, Grand Rapids, Minnesota. 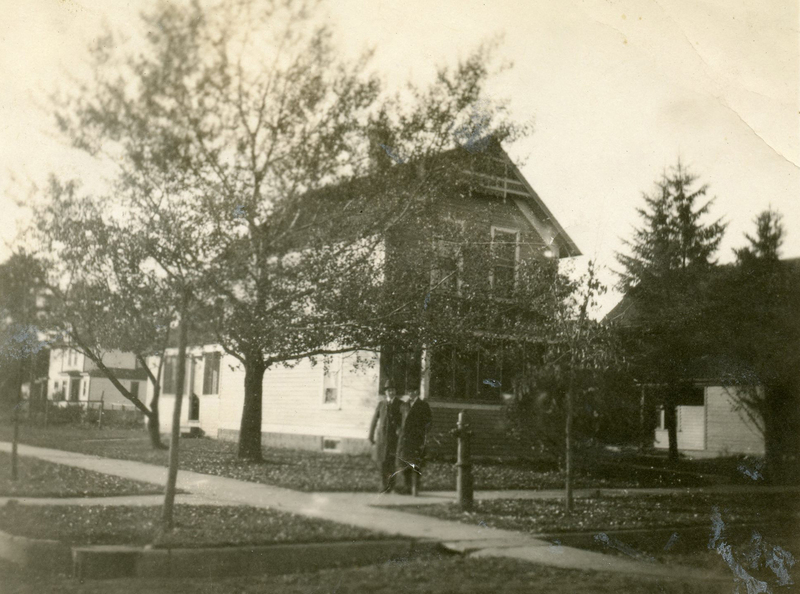 Photo: Judy’s father, Frank Gumm, and a friend, in front of the Gumm Family home in Grand Rapids, Minnesota. The photo was taken before Judy was born. Photo provided by Michael Siewert. Thanks, Michael! 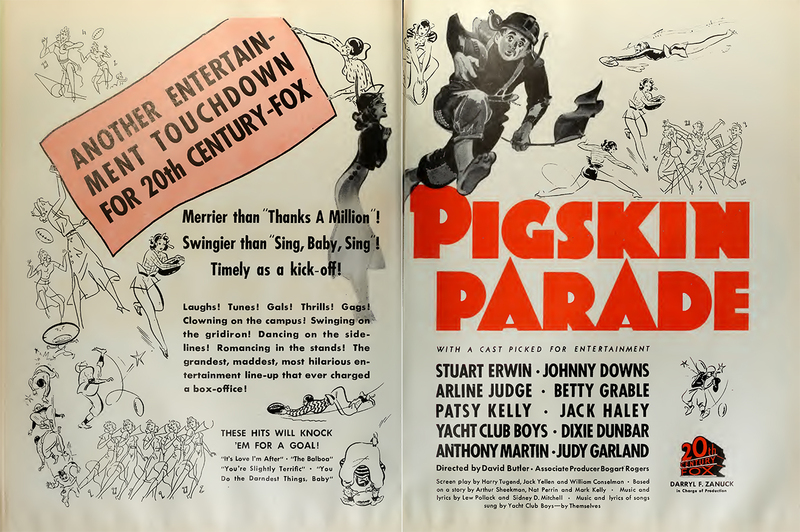 October 13, 1936: This ad for Pigskin Parade appeared in the “Film Daily” trade paper. 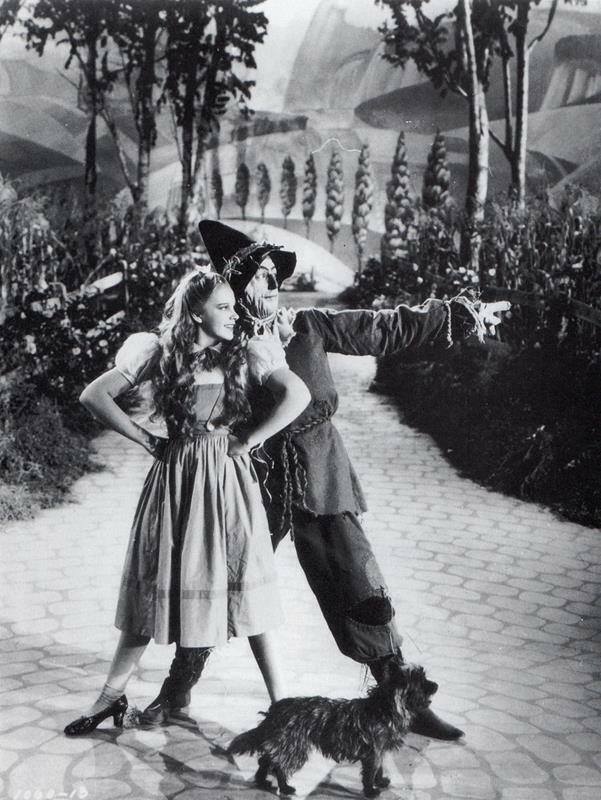 October 13, 1938: The first day of filming for The Wizard of Oz. 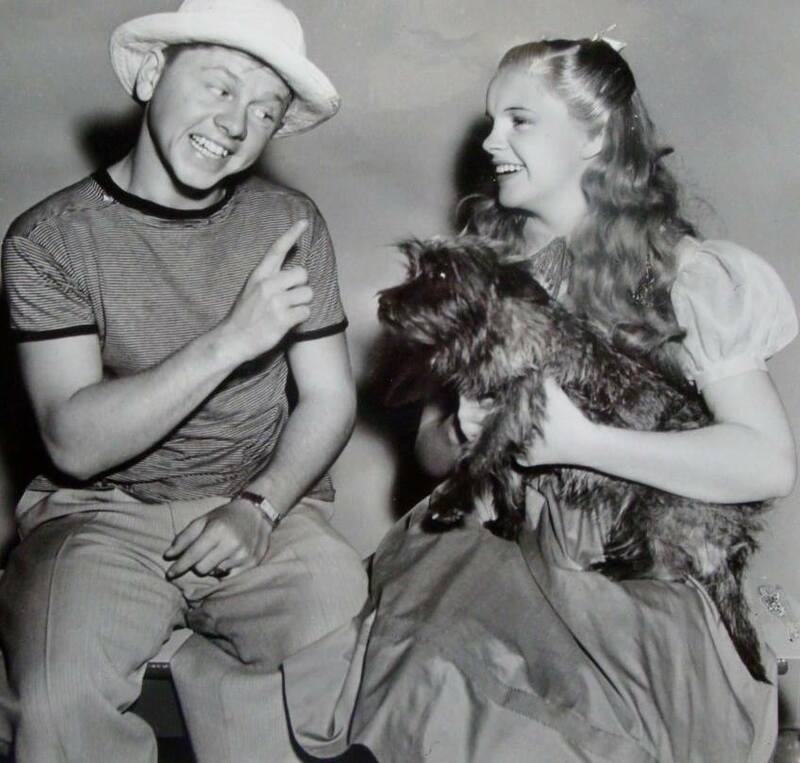 Scenes shot on this day were with Judy and Ray Bolger in the cornfield (“If I Only Had A Brain”) under the film’s original director, Richard Thorpe. Judy also posed for some costume and makeup test photos as well. 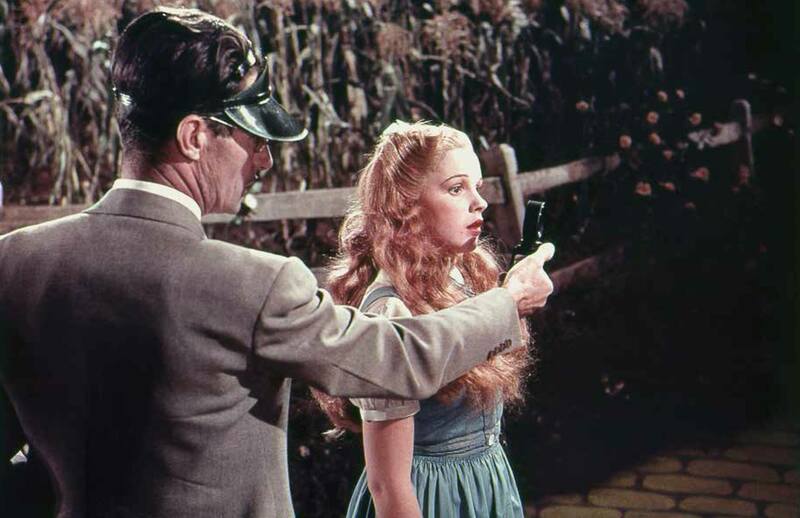 The entire sequence would be re-shot after Thorpe was fired and the costumes and makeup for most of the principles (specifically Judy’s “look” as Dorothy), and even the style of the bricks on the Yellow Brick Road, was changed. Most of the changes were made by interim director George Cukor before Victor Fleming took over. 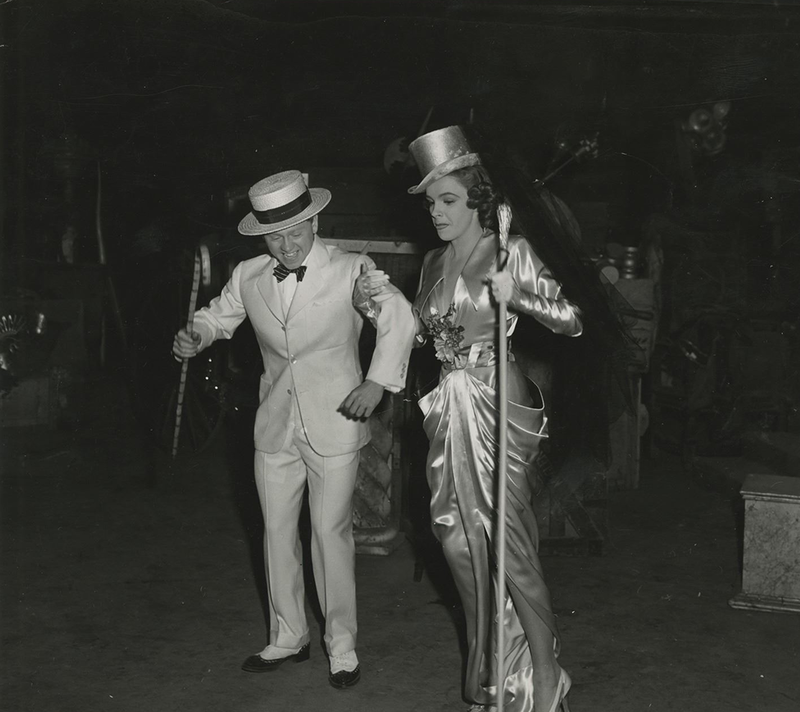 October 13, 1941: Babes on Broadway filming continued with more scenes shot on the “Interior Ghost Theatre” sequence. 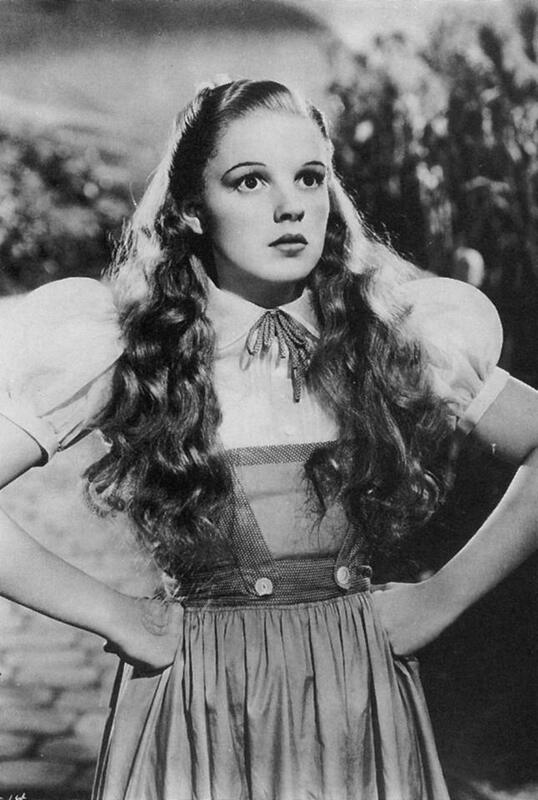 Time called: 9 a.m.; lunch: 2:43-3:43 p.m.; time dismissed: 7:25 p.m.
October 13, 1944: Filming on The Clock continued with scenes shot on the “Interior Subway Platform-33rd Street” set, specifically “train comes in – Alice goes through turnstile and upstairs.” Time called: 10 a.m.; time dismissed: 6:30 p.m.
For a scene that’s only 16 seconds in the film, it seems as though it took a long time to film, but perhaps that was director Vincente Minnelli’s perfectionism at work? October 13, 1945: More work on Till The Clouds Roll By. Judy had dance rehearsals with Bob Alton. Time called: 1 p.m.; dismissed: unknown. 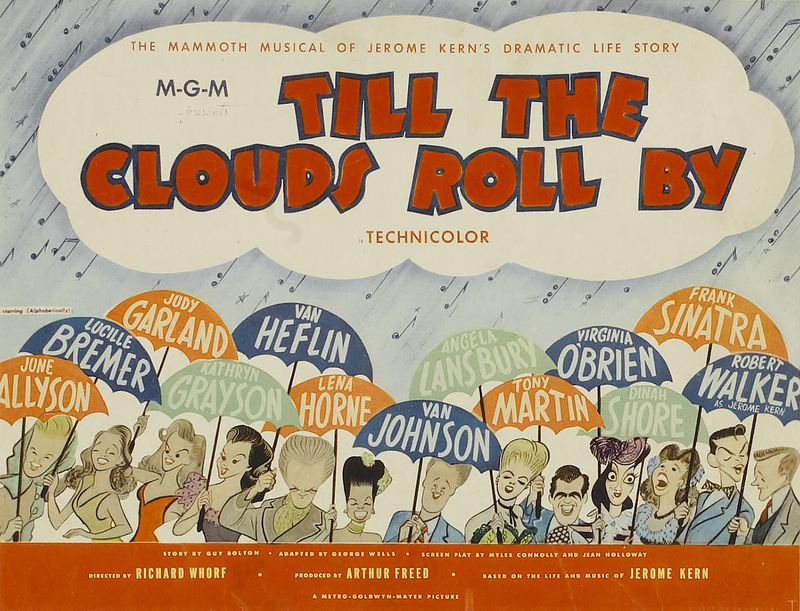 Check out The Judy Room’s Extensive Spotlight Section on Till The Clouds Roll By here. October 13, 1947: Filming on Easter Parade saw its last day with Gene Kelly as Judy’s co-star. 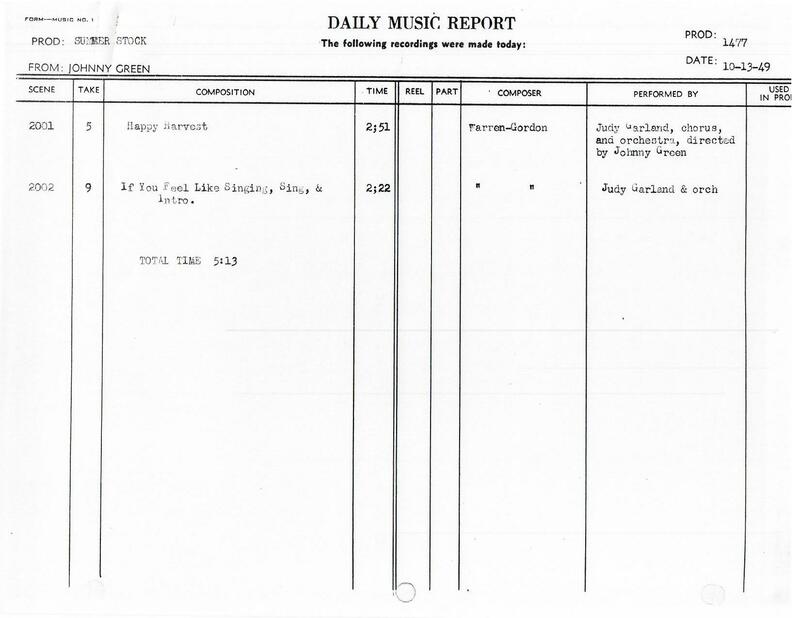 Judy rehearsed “Mr. Monotony” from noon to 4 p.m. Kelly must not have had any work at the studio that day as he managed to break his ankle, allegedly playing softball although he told the studio it was broken during rehearsals. Just two days later Fred Astaire came in as his replacement. October 13, 1953: The second day of filming on A Star Is Born. 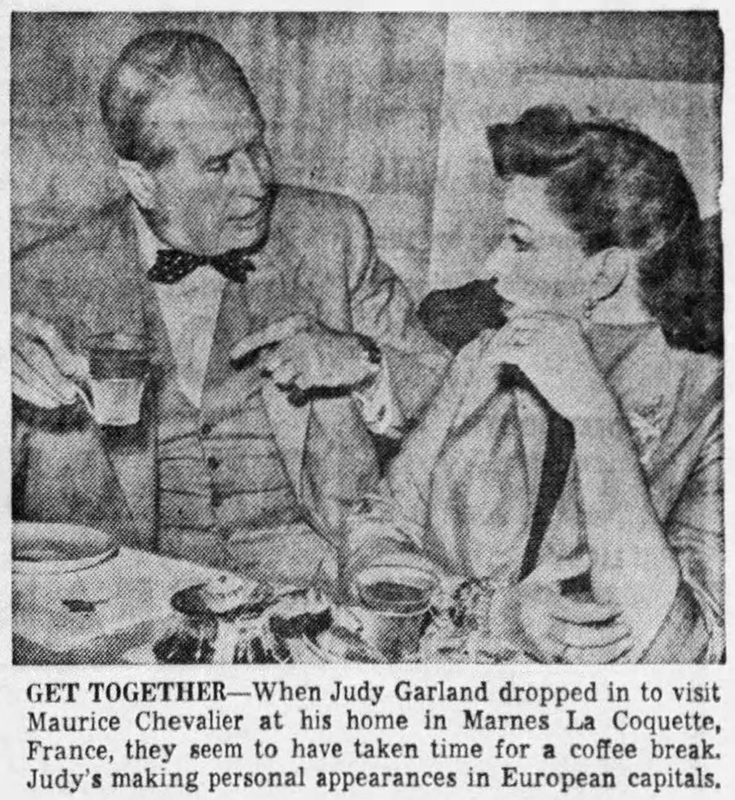 Judy was on the set at 10 a.m. to complete several short, silent shots for the sequence at her hotel late at night, trying to sleep while mulling over Norman Maine’s offer to have a screen test. Her travel up the stairs to Danny’s room was also shot (these were shot first, from 11 a.m. to the lunch break), as was Judy washing her hair, waiting for Maine to call her which was shot from after lunch until 3:20 p.m. Judy wound up having her hair rewashed and reset eight times!. 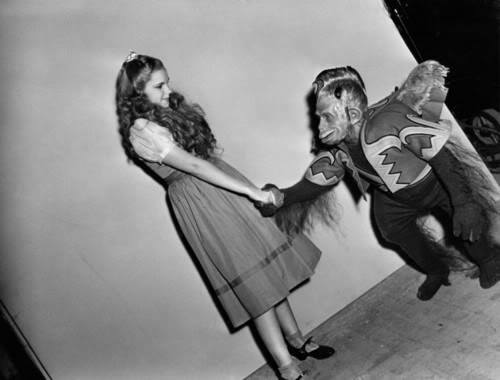 After Judy’s hairstyle and costume were changed, the first “outdoor” scene was completed – where Judy walks comically across a high catwalk, which was actually only nine feet from the ground but shot to look higher up, as Judy ran towards actor Jack Carson. This was done in only two takes. The shot was refilmed on November 3rd after the decision was made to go with the CinemaScope process (image above). 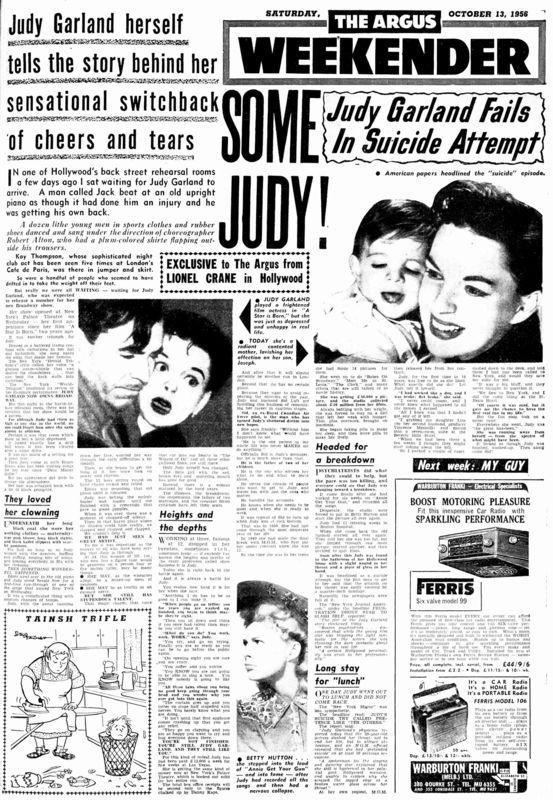 Shooting for the day was finished at 4:30 p.m.
October 13, 1956: The Australian paper “Argus” published this article about Judy’s return from the ashes, so to speak. 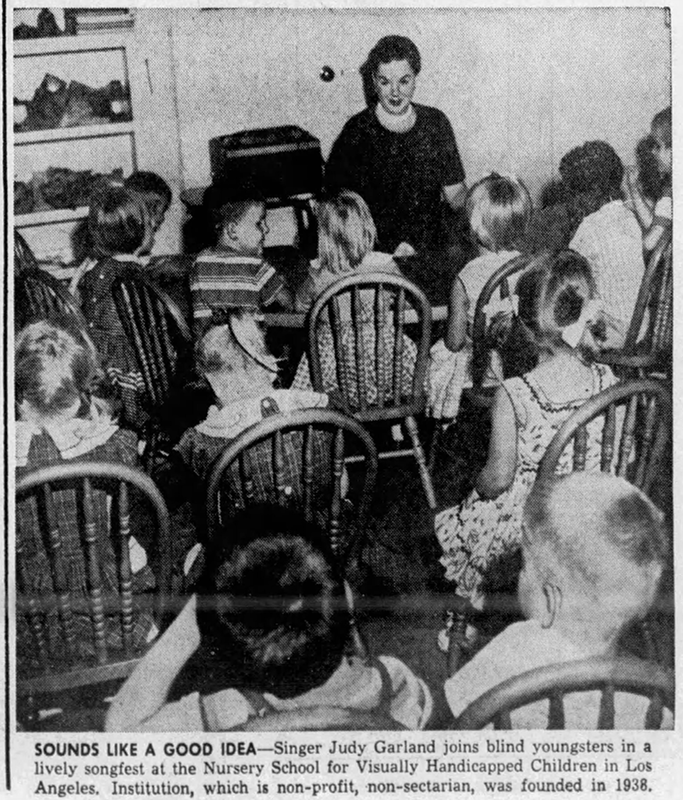 October 13, 1958: The cause of helping children with special needs was close to Judy’s heart. She freely gave her time and talent to help every chance she could. Here she is singing for blind children the Nursery School for Visually Handicapped Children in Los Angeles Institution. It can be assumed that the children had a fantastic experience. 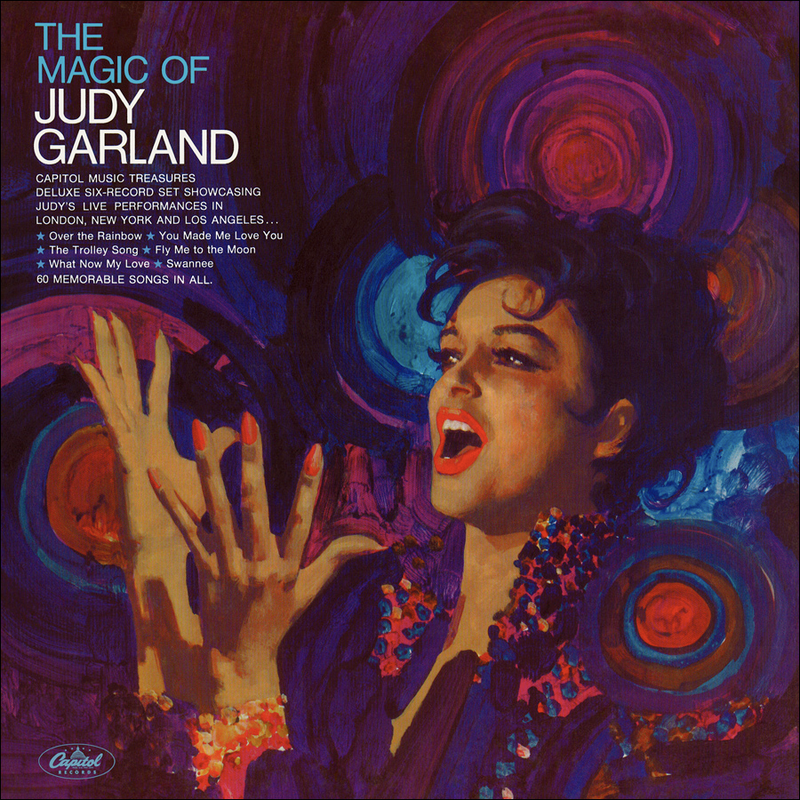 October 13, 1960: Judy was a big hit in Paris, France. 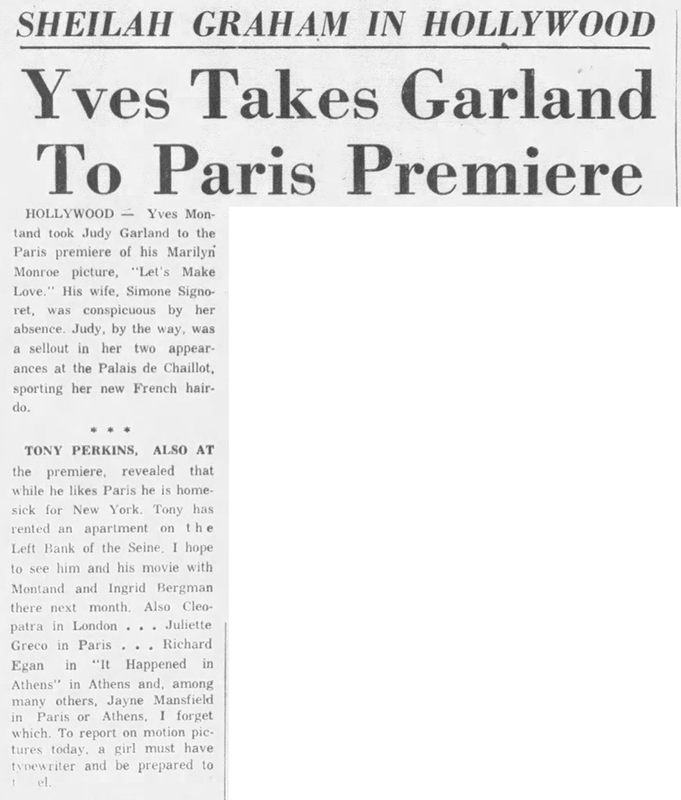 She was seen spending time with Maurice Chevalier at his home as well as attending the Paris premiere of Let’s Make Love with Yves Montand and his wife, Simone Signoret. Montand starred in the film with Marilyn Monroe. 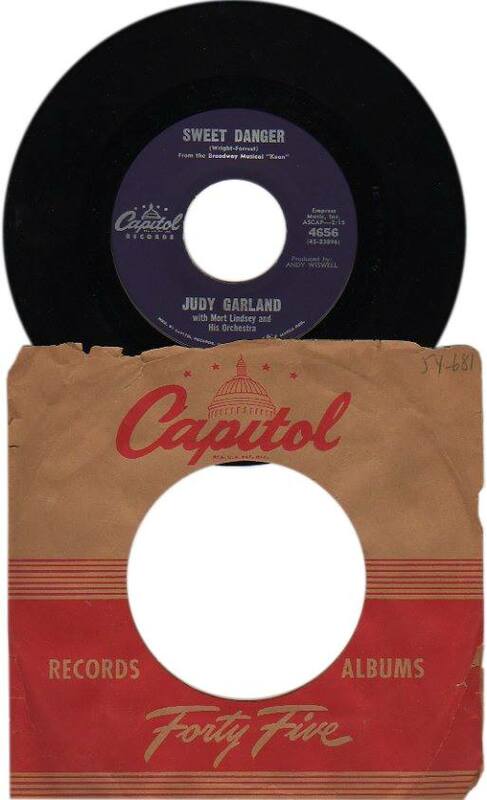 October 13, 1961: The success of the Carnegie Hall album prompted Capitol Records to have Judy go into their New York studios (she was currently touring the east coast), and record two singles for release as a “45.” The two songs Judy recorded were “Comes Once In A Lifetime” and “Sweet Danger.” The brilliant Mort Lindsey was the arranger and conducted the session. 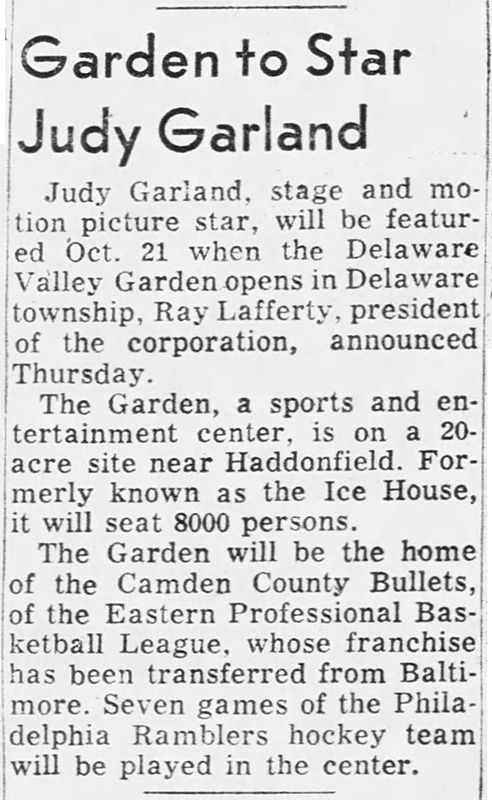 October 13, 1961: Judy was the opening act for the new Deleware Valley Garden sports and entertainment center in Haddonfield, New Jersey, on October 21, 1961. October 13, 1963: “Episode Four” of “The Judy Garland Show” (taped at CBS Television City, Stage 43, Hollywood, California on July 23rd) premiered on CBS TV. Judy’s guests were Lena Horne and Terry Thomas plus series regular, Jerry Van Dyke. 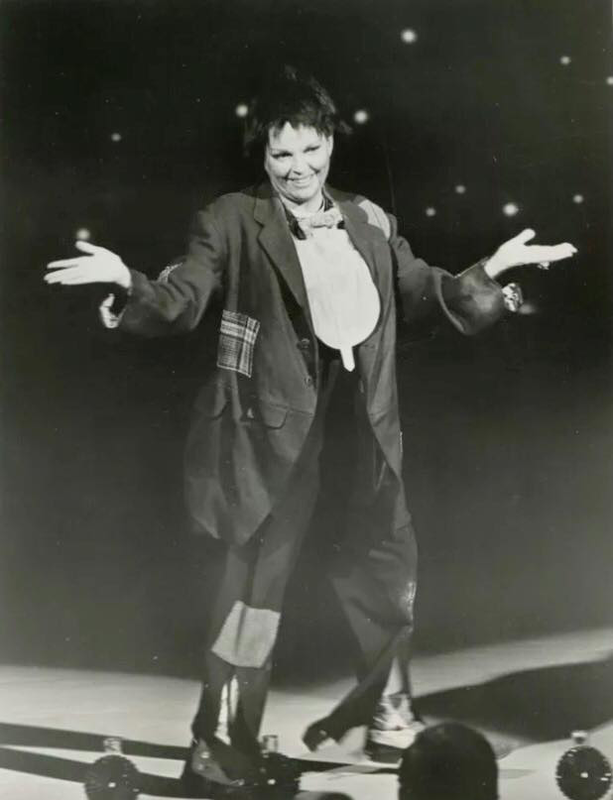 Judy’s songs: “Day In, Day Out” (with Lena); “Judy Sings Lena/Lena Sings Judy” Medley (with Lena); “Mad Dogs and Englishmen” (Lena, Terry, and dancers); and in the “Born In A Trunk” spot, “The Man That Got Away” (in which she told her story about losing the Oscar for “A Star Is Born”; followed by the regular closing song “I Will Come Back.” Judy also chatted with Terry during the “Tea For Two” segment and sang “A Foggy Day” for him. 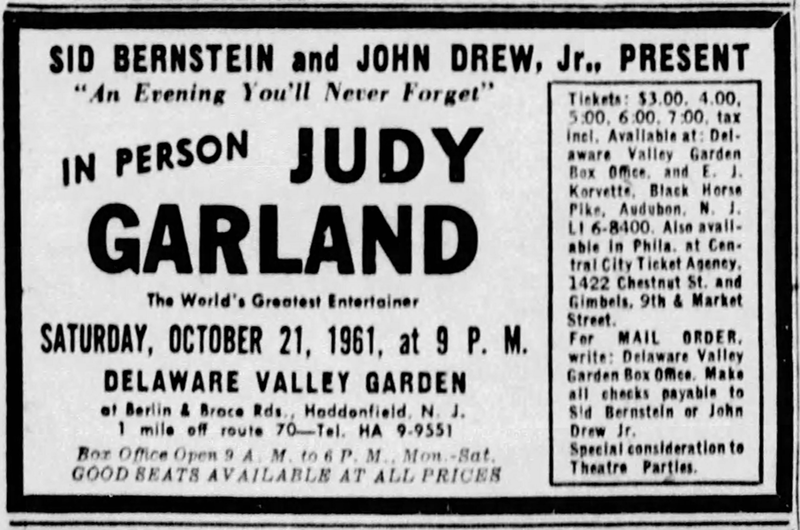 October 13, 1965: The first of two days of rehearsals, starting at 10 a.m., for Judy’s next television appearance which was on “The Hollywood Palace” on October 15th. On this day after the rehearsals, Judy and Mark Herron attended Judith Anderson’s “Medea” opening at the Valley Music Theater. 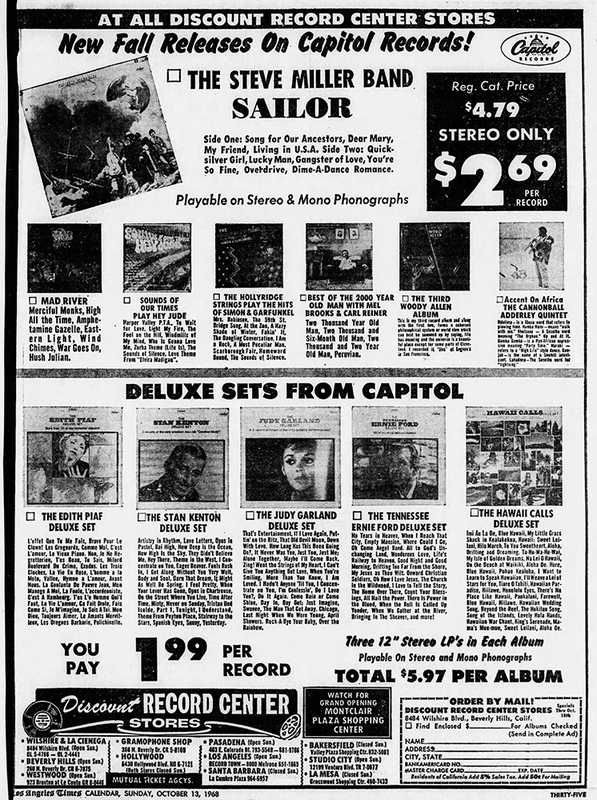 October 13, 1968: The era of the big boxed sets of records was in its heyday. 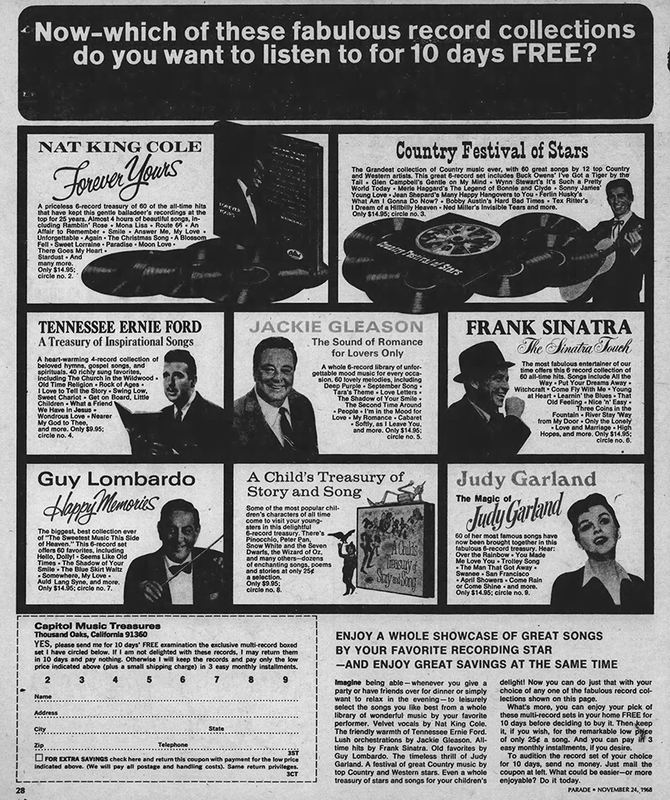 Labels such as Capitol and Longines released sets of usually 6 or 10 long-playing records that were compilations of performances either by theme (“The Forties”) or specific entertainers. These two ads for two separate Capitol sets were published on this day. 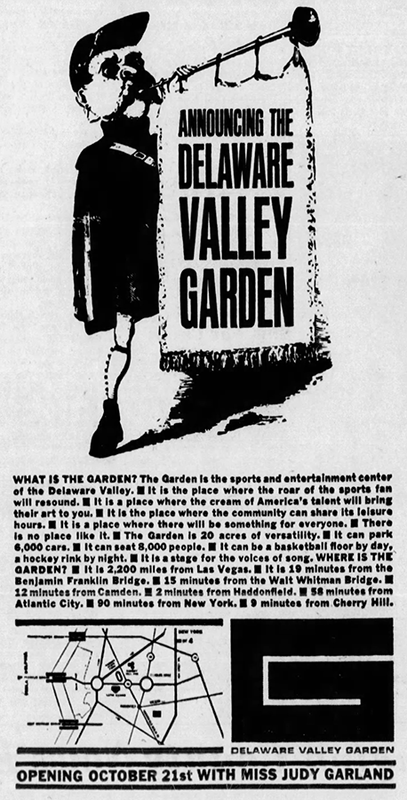 Note that the second ad has a date at the lower right of November 24, 1968, but it was in fact published on October 13, 1968. 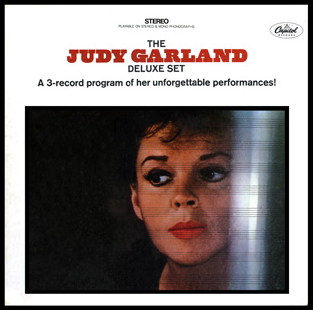 Check out The Judy Garland Online Discography’s “The Judy Garland Deluxe Set” page here. 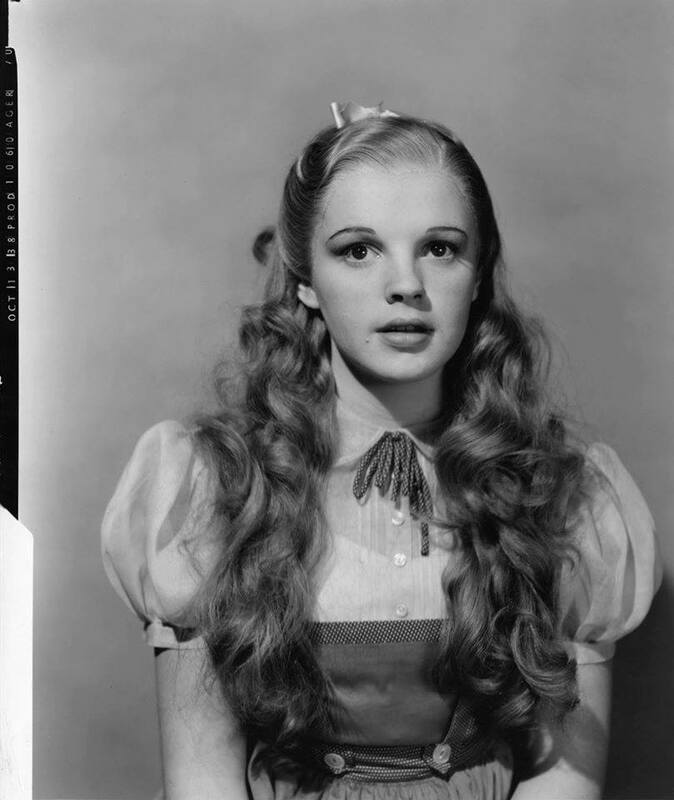 Check out The Judy Garland Online Discography’s “The Magic of Judy Garland” page here.